Right now, in the middle of winter, you might have possibly found yourself in a situation where you crave a good hearty homemade soup packed full of vitamins to nourish your body and your soul. 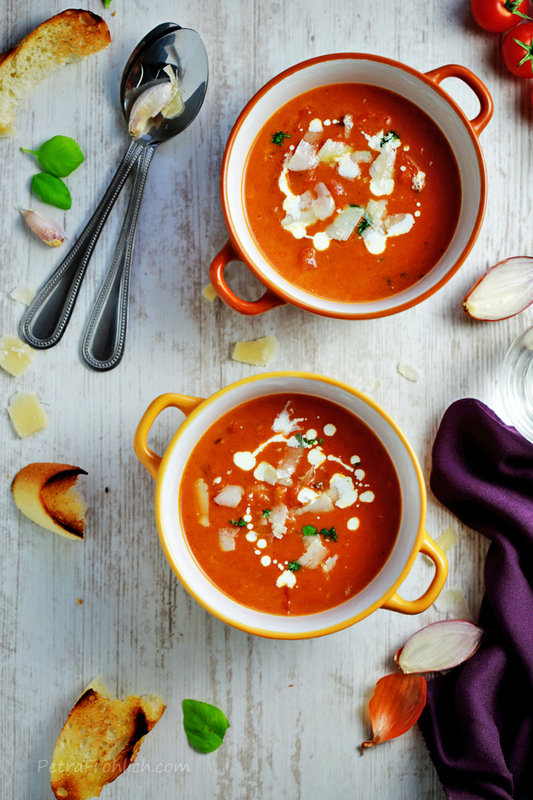 If so, then I am more than happy to recommend this wonderful Creamy Tomato Soup to you. It will comfort you with its silky, sophisticated and amazing taste and will be be ready in almost no time. Place a medium to large saucepan over medium heat, add olive oil, garlic and shallots and sauté for 3 minutes or until shallots are translucent. Stir in the crushed tomatoes. Add in the whole tomatoes one at a time, breaking them up as you put them into the pan. Make sure to also stir in the juice for from the tomatoes. Stir in chicken stock, salt, sugar and pepper until combined then allow it to cook over medium for 10 minutes, stirring occasionally. Reduce heat to low and stir in heavy cream and chopped basil. Simmer for a couple of minutes, then serve. Optional toppings: Parmesan cheese, heavy cream, grilled cheese, toasted bread and chopped basil. This amazing recipe was inspired by ADashOfSanity.com.